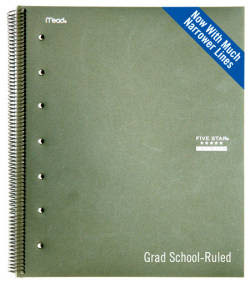 RICHMOND, VA—After decades of only offering ruled notebook paper suitable for college-level education and below, school-supply giant Mead introduced its new grad-school-ruled notebook Monday, which features lines twice as narrow as college-ruled paper. "And with the time you'll save by not having to flip a page every 33 lines, you could earn your Ph.D. a year early." Too bad I only have a Bachelors Degree, so I can't truly appreciate the ramifications of this article.